A wonderful stadium with its field and bleachers, magnetic scoreboards and markers, a double-sided gameboard, foam trays to transport your miniatures and transforming into benches when in play, dice... All of this easily folded and placed to fit in a box! The Fantasy Football Pro Box can be purchased in two different bundles containing a lot of extras. 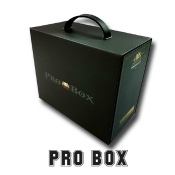 Please notice that you must choose the proper shipping destination for your Pro Box bundle cause it has different prices due to the extra shipping costs requiered for this product because of its size and weight.